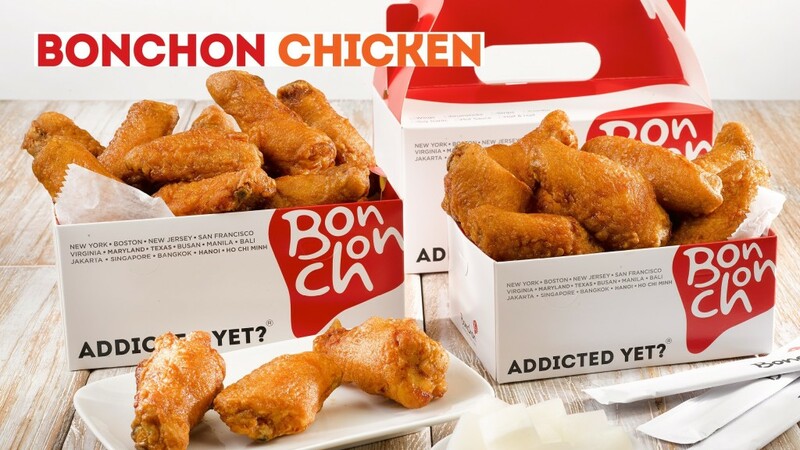 If you are a lover of fried chicken in the DC metro area, you must be a familiar with Bon Chon. If not, you gotta try it! Bonchon Chicken is a South Korean- based international fried chicken franchise that is quickly establishing a presence in the DC area. The first restaurant was established in 2002 in Busan, South Korea. Not surprising, its first location in the United States was in Annandale, Virginia, an area that is home to a large population of South Koreans. It has since spread to areas such as California, Maryland, Massachusetts, New Jersey, and Texas. In addition to its original Annandale location, there are currently locations in Arlington, Centreville, Fairfax, Herndon, Leesburg, Sterling, and Woodbridge. The South Riding restaurant is the latest location, and there are plans to open two more in Alexandria and Manassas by the end of the year. South Riding is a perfect location for Bon Chon. As densely populated as the South Riding area is, there are a very limited number of restaurant options in the area. Residents are forced to drive out to the often congested Route 50 for more restaurant options. With the number of South Riding area residents desperately seeking more restaurant options, Bonchon Chicken is poised to be an immediate hit in the area. Interesting enough, a Reddit user in response to a post about the restaurant launch, wrote “They are going to print money, and they know it.” You bet they are! Besides the opportunity to provide more restaurant options, Bon Chon will be able to take advantage of an area that boasts one of the areas largest household median incomes. As of 2014, the area has a median household income of $142,088. This is over $20,000 over the average Loudoun County median household income of $122,641. Loudoun County continues to be ranked as one of the wealthiest counties in the U.S. A look at the area’s real estate shows that the average listing price in the area is currently $571,339. With these statistics, Bonchon is in prime position to be very successful in the South Riding for years to come. So, you might be wondering, what’s so great about Bonchon Chicken, right? I can always get fried chicken from KFC or Popeye’s. First off, their chicken is cooked-to-order, meaning the fried chicken is cooked specifically for your order, and you don’t have to worry about purchasing chicken that might have sat for a couple of hours. Without a doubt, their “secret weapon” is the sauce they use to fry the chicken. Their chicken comes in two signature sauces, spicy and soy garlic. The spicy sauce is made with fiery and spicy red chili peppers. Per their website, the red chili peppers are dried and grounded up into a special Korea sweet and smokey spice sauce. The second sauce, soy garlic is a deep flavor of sauce sauce mixed with garlic. In addition to the chicken, there are a number of starters and main dishes on the menu. A personal favorite main dish is the Bull Dak, which is a spicy chicken stir fry, topped with thinly sliced scallions, onions, and mozzarella cheese. It is also served with white rice and steamed vegetables. If you are a lover of Kimchi, their Kimchi and Kimchi Coleslaw are pretty good. The great thing about Bonchon is the variety of meals. You can either go the fast food route and order up chicken and french fries or try their healthier main dishes. Also, they have good salads. Or you can mix it up. How does mouth watering fried chicken and salad sound? You gotta try Bonchon if you haven’t already done so. Bonchon is dcrealestateguru.com certified.